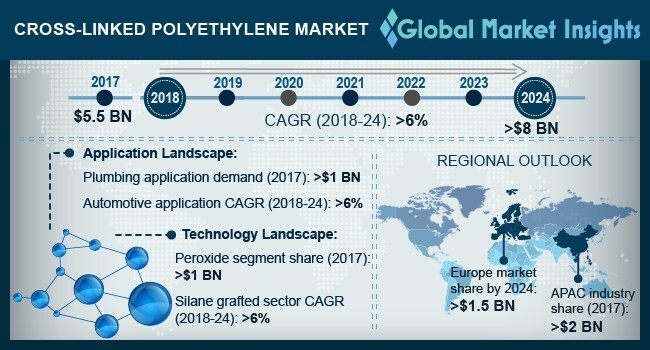 Cross-Linked Polyethylene Market size is estimated to surpass USD 8 billion by 2024; according to a new research report by Global Market Insights, Inc. Growing infrastructural spending particularly in residential construction and public infrastructure is propelling the use of cross-linked polyethylene in plumbing application owing to key properties including high strength, flexibility, and low cost. Increasing popularity of integrated high-low sprinklers thermostatic faucets in bathroom spaces driving plumbing fixtures demand. In addition, surge in bathroom and kitchen renovation projects among middle class population likely to fuel cross-linked polyethylene market size.